Ohhhh, this is fabulous. The world-building is staggering (we're looking at a fantastical yet plausible history of the universe over a few BILLION years here), the plot is a page-turner, the concepts, the aliens, the tech, the science, the physical augmentation, etc., etc. ... everything worked really, really well for me. This is space opera. ACE. 1. The characters are a bit too stand-offish to create much empathy. Their emotional spectrum is so one-dimensional, it's nearly impossible to relate to them. I liked Dan the most, I think, because at least he has something he's passionate about (which is ironic, bearing in mind that he's a clone. 2. The plot twists are so confusing in places that Reynolds has his characters have regular catch-up sessions, just to summarise what's going on. It works, don't get me wrong, but the whole "This is what Khouri knew:" thing was too obvious a device to bring the reader up to speed to just pass me by. Every time it happened, it threw me out of the story for a bit. 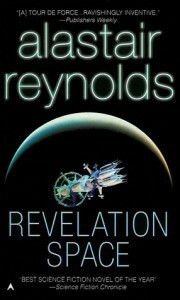 These two minor things aside, I loved Revelation Space to bits. TO BITS.